Founded by Leslie Ballamy in the 1950's, LMB was an established engineering company famous for its own unique independent front suspension design. Other motoring ventures included specialist tuning for the popular (no pun intended!) Ford sidevalve range which were often used as the basis for Kit-cars. In 1960 LMB launched its own complete car the Debonair. 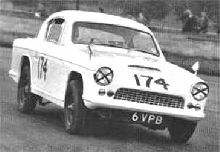 The car was produced in conjunction with another Ford "Special" producer, Edwards Brothers. Although the project lasted only two years 50 examples of the Debonair were completed and the chassis went on to form the basis for the Reliant Sabre.